The PGA Tour returned to New Jersey last weekend as the rotating set of courses for The Barclays tournament came to Plainfield Country Club in Edison. 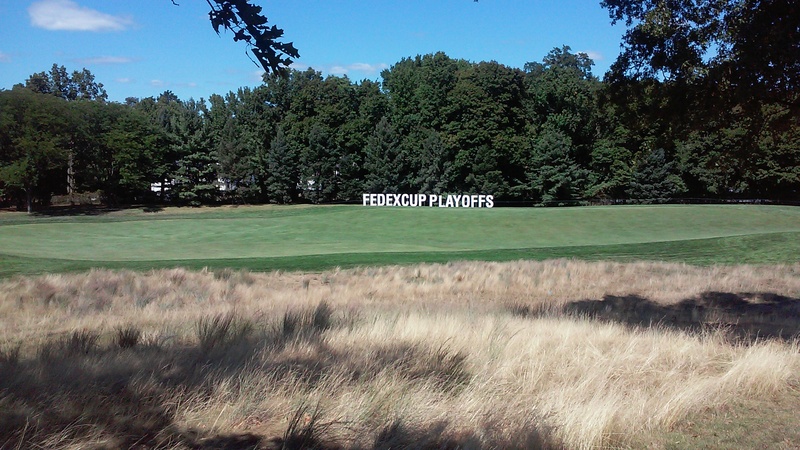 With this being the first event of the FedEx Cup Playoffs, it is a great opportunity to see an excellent field as 125 players get in from the season standings. My parents were in town for the coming weekend to see our six-month old daughter, so my Dad joined me at the event. I prefer going to see the PGA on a Friday, as it gives the best opportunity to see players and by going on Sunday, it’s very difficult to actually follow the action. If you care about the results and follow the conclusion, it’s much better to do so at home. Still, I highly recommend spending a day out on the course. The transportation set-up was very smooth and we dropped $10 to use Oak Ridge Park for parking to reach the shuttle to the course. While operations were smooth, the dry, dust-bowl of the park left some cars looking like they’ve been through a Haboob. Entry gates are conveniently before the shuttle and no water or food is allowed inside, you know, so the PGA Tour can make even more money off of you. Speaking of that, never buy a ticket from their website. This is one of those instances where StubHub helps the customer as so many individuals get company tickets (which for a grounds pass are all the same price) and they’ll sell it for much cheaper if they can’t attend the event. Plus, look for other deals as if you plan in advance MasterCard has complimentary tickets for card holders. Once we got to the course, I marveled at the temporary city built. We’re not just talking tents on the ground, but entire erector-set bridges, walkways and stores. I guess that’s where the ticket money goes. There are some fun freebies in this area including swing analysis stuff. Plainfield Country Club was in remarkable shape and we started by walking the course to get some perspective and see the layout. This is the 72nd best golf course in Golf Digest’s rankings and I found the course quite wonderful with an intriguing, old-school layout. The best way to see it is by following a group, which we did by following Tony Finau for a good chunk of the Back 9, while it was still pleasant in the morning. Loved watching him as he is going to be winning very soon…big guy, easy-going with a great swing. It’s really best to stay clear out of watching the biggest 10 names in the field as following them means dealing with huge crowds where you can’t see and often those huge crowds contain a bunch of smart-alec morons. These are the dopes that you here on TV and there are many more in person, as I heard comments like “Chicken” for a lay-up, laughing at a shank and someone yelling to Jason Day not to fall again. Absolute idiots and I can’t stand even being in their presence despite it being the minority of the crowd. Again, this only really happens for the biggest named groups or the later pairings on the weekend. Since these are the people that only know pop-culture golf, follow the guys that are still pretty good. A friend who went last year to Ridgefield followed Jordan Spieth with maybe about 20 people. Most casual sports fans didn’t know him, but golf fans who saw him in the Top 10 almost every tournament last season, did. Hope that doesn’t come off too snobish, but either picking a hole and seeing them once or following non-huge groups is the way to watch. As for sitting at one spot, we set-up shop behind #11 green for awhile, which was quite entertaining as the Par-3 provided some dramatics as the guys tried to hold the green. Plainfield is a great course and the event is really worth a day’s visit.